Stable cottage is created from a stone built-stable block dating from the 1840’s. 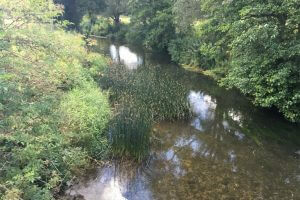 It is located in the beautiful Georgian village of Freshford which lies at the junction of the Frome and Avon valleys in the southern Cotswolds. There are some wonderful walks to local pubs following the riverside and canals. 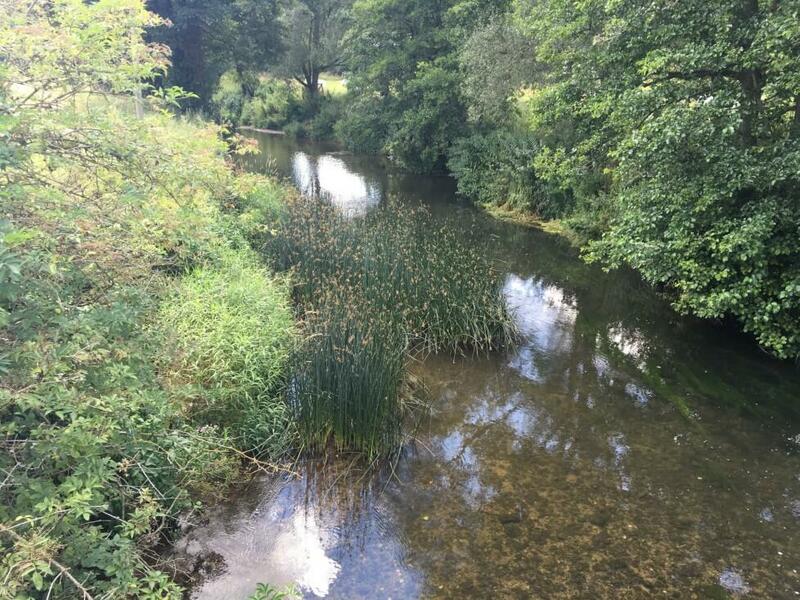 All just 15 minutes from Bath by car but the secret of this location is the 9 minute train journey to Bath from the village station, just a short stroll from the cottages. 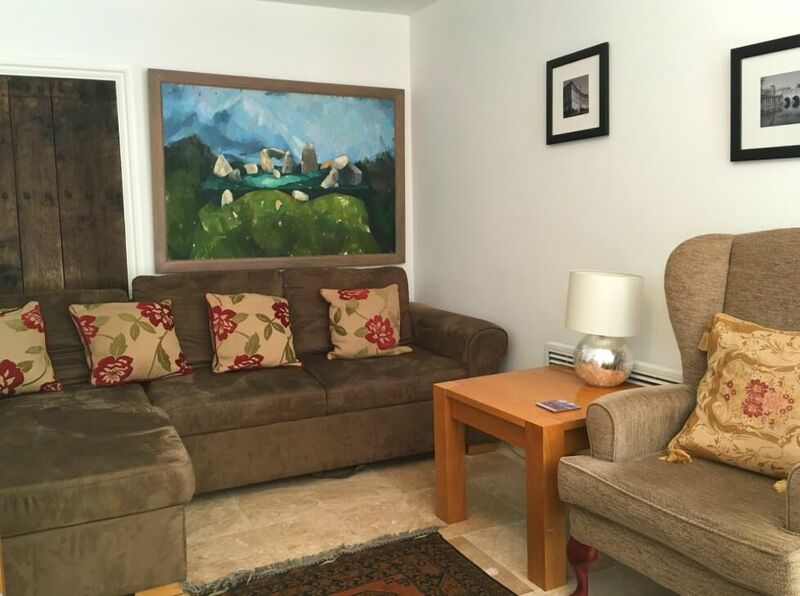 Stable cottage is a newly renovated, limestone floored, 3 bedroom, two bathroom (one is en-suite) cottage. It has large windows to the front of the house filling the bedrooms and downstairs with light on a sunny day. 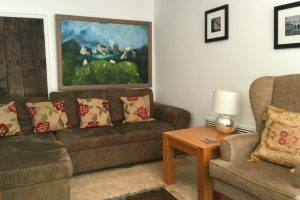 It has an open plan living/dining area with free view TV/DVD and two large suedette couches and comfortable chairs. For dining there is a blond Oak dining table and chairs to seat 6 . The Stables can accommodate 6 people in three bedrooms (two king size and one double) . The kitchen is fully equipped with cookware,dishwasher and washing machine . 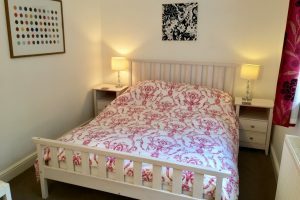 The house also offers Iron/Ironing board, Hairdryers All bed linen and towels . There is a Welcome pack of tea, coffee, sugar, milk, bread, butter, eggs and bacon. Free WiFi. There are also books and board-games in the house for the use of guests. If you have any questions on Bath and the local area before or during your stay please let us know. We would be delighted to help. 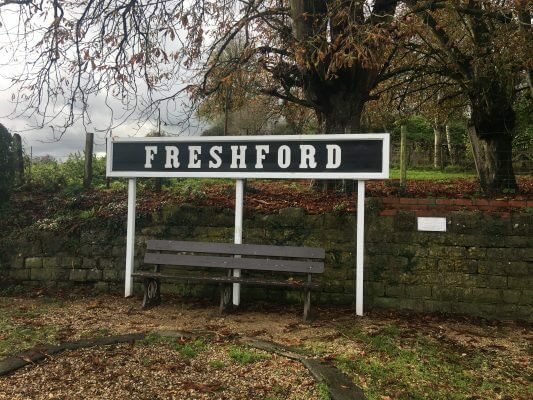 Freshford is a beautiful ancient village with a wonderful pub just a few minutes walk from the cottage( The Inn at Freshford) that serves restaurant quality food and all the local beers and ciders.They have an excellent fully stocked( from wine to organic humus! )community shop that also has a good quality cafe that serves lunch. There is also a local doctors surgery. The village is nestled at the junction of the Frome and Avon valleys . The Kennet and Avon canal is a 15 minute walk from the cottage. You don’t need a car to stay in the cottage. The village station is a few minutes walk away. Trains hourly off peak and thrice hourly at peak times. Bath 9 mins, Bristol 22mins. There is also a local bus service to all the adjacent villages and Bath. The cottage has two parking spaces suitable for one medium and one small car or a single large SUV.the surrounding towns you might want to visit. 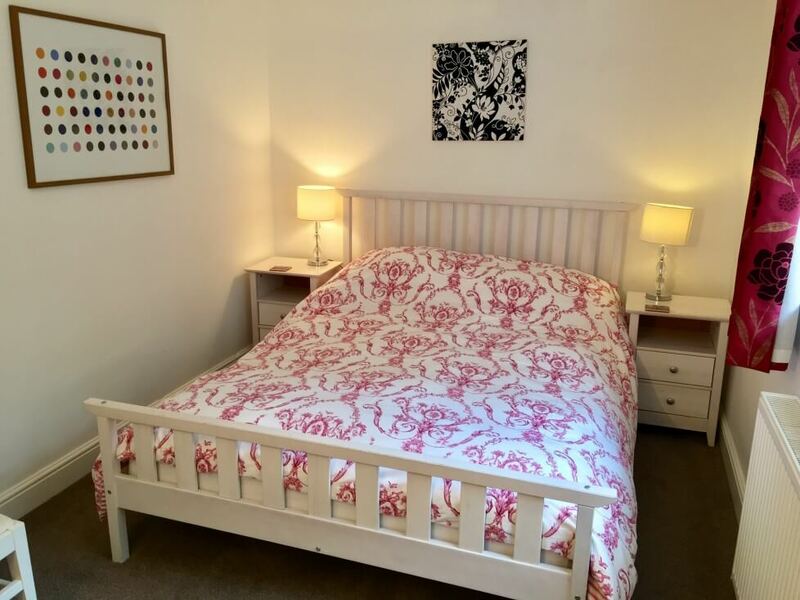 Bedrooms: Three double bedrooms, one of which has an ensuite bathroom and one has a TV. Bathrooms: The family bathroom has a full size bath with a “rain water” style shower over and a detachable shower head for hair washing. The floor and walls are finished in limestone. 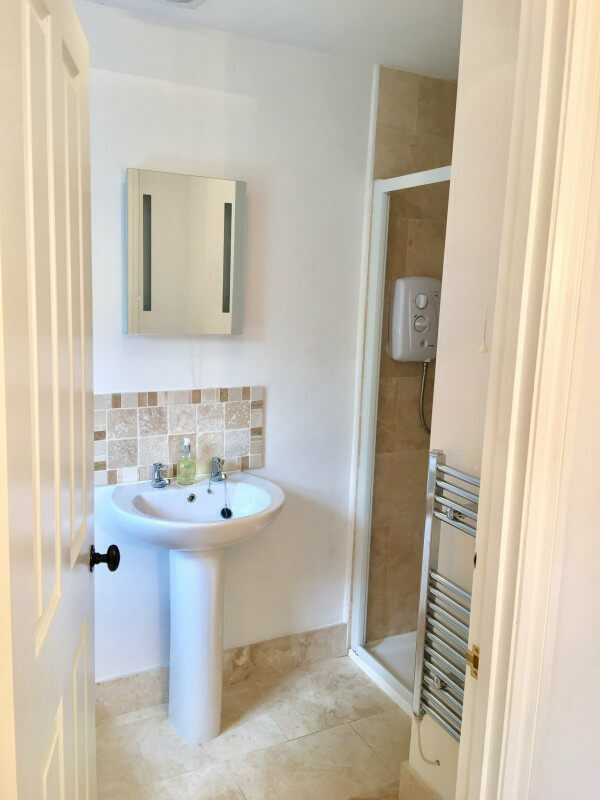 The en-suite shower room has limestone tiles,loo and basin. 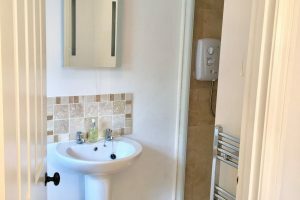 Kitchen: The fully fitted kitchen has a white inset enamel sink, under unit lights, dishwasher, gas hob, electric oven, microwave, fridge with four star freezer compartment, kettle, toaster and washing machine/dryer. Entertainment: Free WI-FI is available with a download speed of up to 8 megabits. the access code is in the welcome folder. Large wall mounted TV in lounge with integral DVD player. Small wall mounted TV in bedroom. Family games and DVDs in the lounge. General Points: Gas central heating. All bedding and towels provided. Parking: Parking space for two medium size cars or one large car. Train Station: Tiny station with trains to Bath (10 minutes), Bristol, Weymouth Bradford on Avon and many other places. Food Stores: Comunity shop, cafe, childrens play area and art gallery in village about ten minutes walk. Sites within 15 minutes drive include the World heritage Site of Bath with the famous Roman Baths and Georgian architecture, excellent shopping and dining facilities, Theatre Royal, Odeon and Art House cinema, rugby at ‘The Rec’, many festivals and free music most nights and Bradford on Avon with the 14th century Tithe Barn and Saxon church. Sites within an hours drive include Stonehenge, Avebury, Highclere Castle, Salisbury cathedral, Longleat, Bristol , Wells and many National Trust properties.